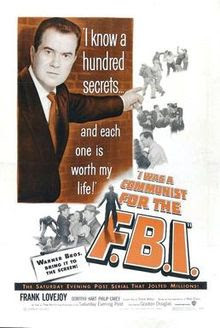 It's an old McCarthy era right-wing propaganda film. I've never seen the whole thing, but it used to be on cable TV a lot back when I was in college. (I think they were running it partly as a joke, partly as a time-piece). So I caught some bits and pieces of it. There was one scene that has stuck in my mind all these years--at one point, the main character is giving a speech about why he's making all these sacrifices for the anti-Communist cause. And he says he's doing it because "...I want to go on living in a country where you can walk around with your head up high, where you can talk back to cops, and where you can holler out loud in print..."
It struck me as strange even back in the 1990s. A country where you can talk back to cops was decidedly not the country that the right-wingers wanted. Weird to think that in 1951 this was actually a conservative value. The irony has stuck with me over the years as news story after news story has demonstrated that in America, you can not talk back to cops. If this ever was America at one time, that America is long gone. What's ironic, then, is that in actually communist countries you can totally talk back to cops. Or at least in communist Vietnam, where I'm currently living. Several videos have gone viral (mostly on Facebook or on Vietnamese media) showing angry Vietnamese motorists shouting and even hitting the police. And appearing to get away with it. In the Expat Forum page, people often write things like, "Wow, if you did that in my country, you'd be killed." How ironic, then, that in democratic America, you are putting your life at risk whenever you confront the police. And in communist Vietnam, you can totally get away with it. I wanted to share some these videos, but I'm having trouble finding them on Youtube. (I think many of them are only on Facebook--several more are probably titled in Vietnamese only). I found one video--posted below--and that will have to suffice for example. You'll just have to take my word for it that there are more like this. Okay, now in the interest of honesty, I should probably tell you that while I was searching for the above video, I found several other youtube videos that undermined my thesis--videos of Vietnamese police being overly aggressive. I guess it's hard to generalize too much. There are probably police that are overly timid in both Vietnam and America, and there are also police that are overly aggressive in both Vietnam and America. But what you don't see in Vietnam is reports of police shooting people. From all the videos I saw, it looks like the Vietnamese police either don't carry guns, or don't ever feel the need to draw them. Actually it's like that in a lot of countries. In England, Australia, and many countries in Europe, the police don't carry guns. Of course the police have to carry guns in America. I understand that. There are so many guns among the general population in America that the police have to arm themselves for their own safety. People who take an insurrectionist interpretation of the second amendment often say that the 2nd amendment is necessary to prevent a police state. But, in fact, the 2nd Amendment is why we have a police state. There's no problem of police shooting unarmed civilians in England, Australia, Japan, or Communist Vietnam.